A color photo of the Maynard Memorial Day Parade, dated May 28, 1979. L-R: Edward Brennan, playing the tuba; Alexander DeGrappo; Tierney; Pinolento; Schultz; and, Parish. Alexander DeGrappo was the Band Leader at Maynard High School during this time. 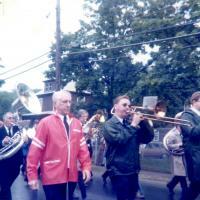 Edward Brennan played in the Maynard Community Band annd other bands in the area during the 1970's. “Maynard Memorial Day Parade - 1979,” Maynard Historical Society Archives, accessed April 24, 2019, http://collection.maynardhistory.org/items/show/6601.